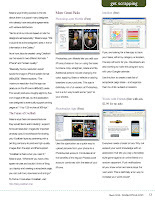 Editor's Note: The following article was previously published in the March 2010 issue of DST Insider, a publication of DigiShopTalk.com. 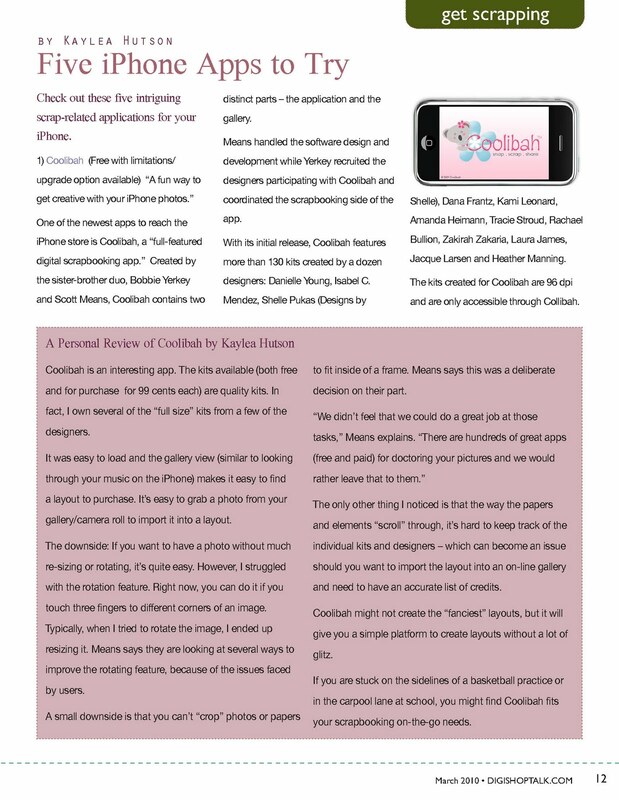 One of the newest apps to reach the iPhone store is Coolibah, a “full-featured digital scrapbooking app.” Created by the sister-brother duo, Bobbie Yerkey and Scott Means, Coolibah contains two distinct parts – the application and the gallery. Coolibah and coordinated the scrapbooking side of the app. With its initial release, Coolibah features more than 130 kits created by a dozen designers: Danielle Young, Isabel C. Mendez, Shelle Pukas (Designs by Shelle), Dana Frantz, Kami Leonard, Amanda Heimann, Tracie Stroud, Rachael Bullion, Zakirah Zakaria, Laura James, Jacque Larsen and Heather Manning. The kits created for Coolibah are 96 dpi and are only accessible through Collibah. Means says limiting access to the kits allows them to support many designers who already have exclusive agreements with various distributors. Means says there are several features they would like to add including: support for lower-resolution images (for imported photos); layout import/export for sharing your Coolibah layouts; partnering with a printing company to produce high-quality images from the app; and iPad support. Photoshop.com Mobile lets you edit your iPhone photos on the run using the basic functions crop, straighten, rotate and flip. Additional actions include changing the color, applying filters or effects or adding boarders to your pictures. This app is definitely not a full-version of Photoshop, but is a fun way to add some “pop” to your photos. Use this application as a quick way to upload pictures from your phone to a Photobucket account. It includes all of the benefits of the regular Photobucket account combined with the ease of your iPhone. If you are looking for a free app to track your tasks, either by category or location, this app will work for you. Developers are also working to make this program sync with your Google calendar. Use Intuition to create a task list of scrapbook page ideas – and organize them by child, subject or location. Everyone needs a break or two. Why not expand your word knowledge with an application that lets you play a Scrabble-style game against an online friend or a random opponent. Push notifications let you know when someone plays the next word. This is definitely a fun way to increase your word power! Coolibah is an interesting app. The kits available (both free and for purchase for 99 cents each) are quality kits. In fact, I own several of the “full size” kits from a few of the designers. It was easy to load and the gallery view (similar to looking through your music on the iPhone) makes it easy to find a layout to purchase. It’s easy to grab a photo from your gallery/camera roll to import it into a layout. The downside: If you want to have a photo without much re-sizing or rotating, it’s quite easy. However, I struggled with the rotation feature. Right now, you can do it if you touch three fingers to different corners of an image. Typically, when I tried to rotate the image, I ended up resizing it. Means says they are looking at several ways to improve the rotating feature, because of the issues faced by users. A small downside is that you can’t “crop” photos or papers to fit inside of a frame. Means says this was a deliberate decision on their part. The only other thing I noticed is that the way the papers and elements “scroll” through, it’s hard to keep track of the individual kits and designers – which can become an issue should you want to import the layout into an on-line gallery and need to have an accurate list of credits. Coolibah might not create the “fanciest” layouts, but it will give you a simple platform to create layouts without a lot of glitz. If you are stuck on the sidelines of a basketball practice or in the carpool lane at school, you might find Coolibah fits your scrapbooking on-the-go needs. Editor's Note: As a freelance journalist, I was provided a copy of Coolibah. This column/feature was not influenced by a free iPhone app - just in case you (or the FTC) were worried about this detail. Thank you for the wonderful review of our app, Coolibah! It's very well written. We've actually been in the App store since Nov 2009. We can't believe it's been almost a year! The response has been wonderful. Right now we have an update in progress that addresses a few of the issues that you mentioned. 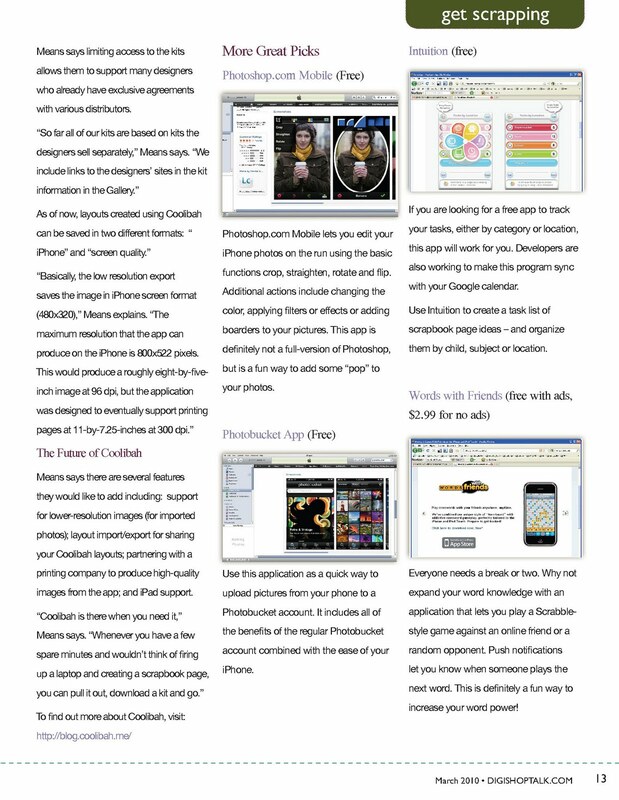 And... Coolibah was able to make iPad support available for the launch of the iPad. Scott worked amazingly hard on that update! Coolibah is great digital scrapbooking app for iPhone! I really liked the excellent features of this app.